Recently there has been a lot of discussion about schools in Calais. I was graduated from Calais Academy 52 years ago, went to Bowdoin College on a full scholarship, and found my Calais education very solid. Other classmates found success at Dartmouth. Colby, and Maine Maritime Academy. Perhaps it would be of interest to bring back memories of the teachers I had, since I am sure that the actual teaching is far more important than the actual school buildings. To be sure of my recollections, I am grateful to Eleanor Mundie O’Neill for her quick confirmation of names and places. When I started school in 1930 my father was caretaker at the St. Croix Country Club and we lived down there, so I had to walk from there to the South Street School. Along the way would be Vincent Armstrong, Foster Townsend, Jock and Elbridge Davis, Netty Nicholson, and on Hinkley Hill, Paul MacMillan, Priscilla Tupper, and Jack Reardon, so I had company on that long walk and we thought nothing of it. Luckily, when I was in second grade, my family moved to their house on Hill Street, just a block from the South Street School. Bell Woodcock was the first grade teacher – very kind and patient. She was quite tall and had white marceiled hair in the 20’s style. To teach reading she used to hold up cardboard signs for us to read, and she soon discovered that I was either dumb or needed glasses, since I couldn’t read “I see the dog” or “She lives in the house ” Sure enough, I was very near -sighted and astigmatic besides. grade. I remember her as the only teacher who made me stand in the corner for talking in class. I remember that when she brought me up to her desk she wore very bright red lipstick that contrasted with the other teachers who wore no make-up. 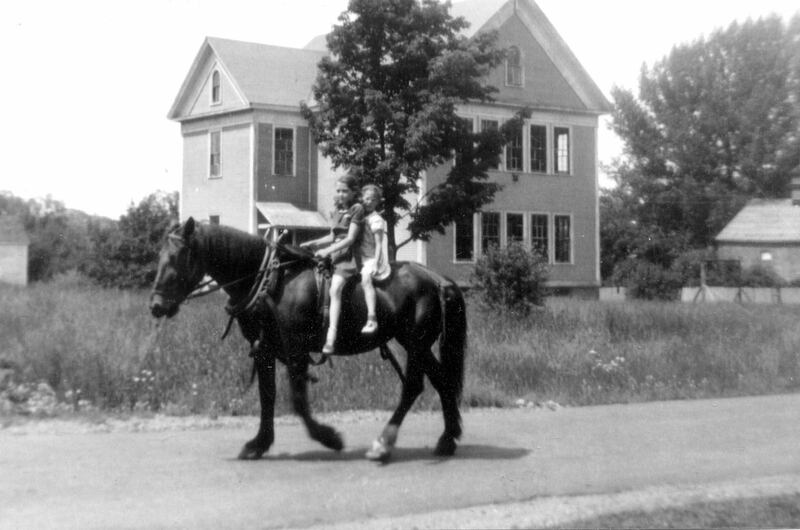 Edith McKusick taught 4th grade and was a very intelligent maiden lady. She was from a distinguished family and just listening to her was very informative. She may not have had good control but I seemed to learn a lot more in her class than just the regular textbook material. Florence Boone was one of John’s teachers. Seen here: Back row from left Mary Phinney, Edith Bagley, Harriett Green, Florence Boone(teacher) Helen Kyle , Gladys Bohanon, Margaret Goode, Helen Winchell. Third Row: Dorothy Irvine, Charlotte Maloney, Mable Gillis, Daisy Alexander, Ruth Saunders, Marjorie Creamer, Ellen Godfrey, Mary Leeman. Second Row: Clarence Arnold, Bernard Levy, Donald Mitchell, John Veasey, Virgil Smith, lloyd Clark, Charles Pomeroy, First Row: George O’Neil, Wilbur Hooper, John Riley, Roy Leavitt, John Alley, Merle Mahar. Kathleen McVay was a tall, raw boned woman. Her sister Ella taught in the other elementary school on Church Street. As teaching principal, Miss McVay was in charge of discipline. Although I don’t recall too much trouble, anyone misbehaving could expect to “get the strap”. I do remember a sixth grade boy returning to the room, smirking to his friends but rather sheepishly examining his palms under his desk. In any case, students in those days understood that if they got into trouble at school, when they got home they would get more punishment. The parents supported the school 100%. For some curious reason, I don’t remember much about my middle school years. Gerald Scovil, a rather pleasant, easy-going man was principal and taught math. 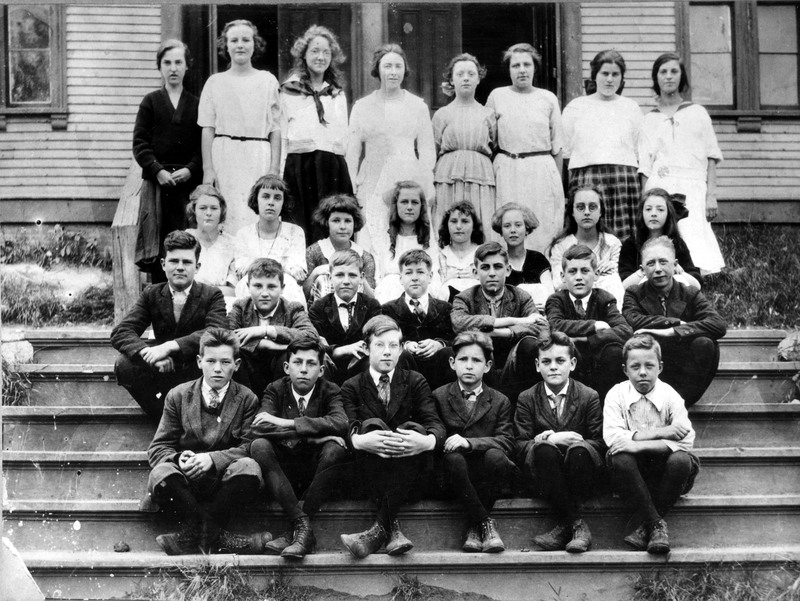 Gertrude Spires taught English and Florence Boone handled the science classes. Her sister Mary taught commercial subjects in the high school Henry Thomkins taught manual training and I progressed so much in his class that I built a Martha Washington Sewing cabinet for my mother When I look at it today I am impressed with my workmanship. The teacher who stands out in my memory is Ethel MacPherson, who taught math and Latin. She was imaginative and had a lively class. At Christmas she would give each of us a card with “Laeta tibi Saturnalia”, Latin for Merry Christmas. It was at this time that the Church Street elementary school burned and we had to go on double sessions, meaning half the year we went to school from 7:30 in the morning to noon and the rest of the year from noon to 5:30 p.m. Harold Hamilton was the social studies teacher and baseball coach. Because I was tall for my age he tried to get me to play basketball but I refused since I would have to wear a protective devise over my glasses, somewhat like a catcher’s mask, and I didn’t want to look even more geeky than I already looked with my coke-bottle glasses. 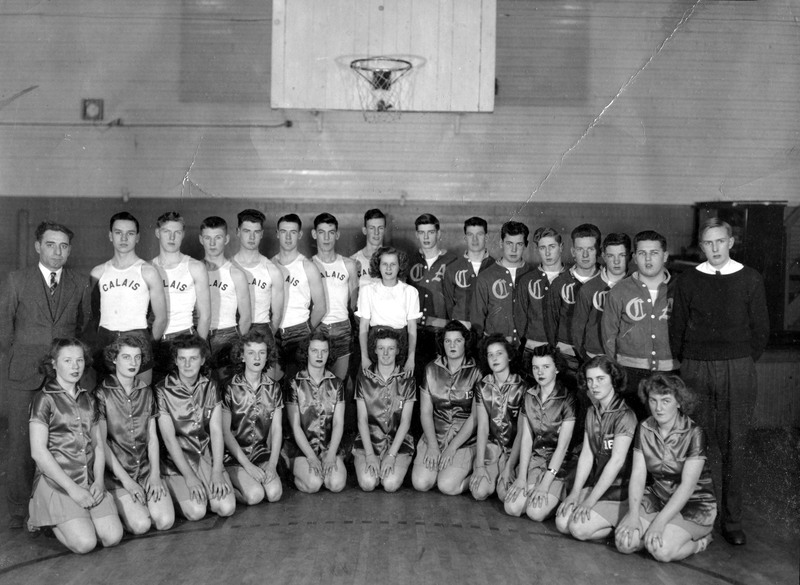 Leo Langille was gym teacher but our gym classes were only once a week, since we had to travel around to all the other schools. Dorren Gregory was the health nurse that came from time to time and her big pitch was to have tonsils taken out. My folks resisted and I am glad since today that fad has completely changed. The Calais Academy building was a big square structure with a bell tower and wings. Fred Tarbox was principal and taught physics. He had a brush-cut hair style and a rather pleasant but no nonsense manner Harland Keay was assistant principal. I remember his running the Kippy Karnival when the gym was turned into a veritable wonderland of booths for games of chance, rivaling Las Vegas to our young eyes. 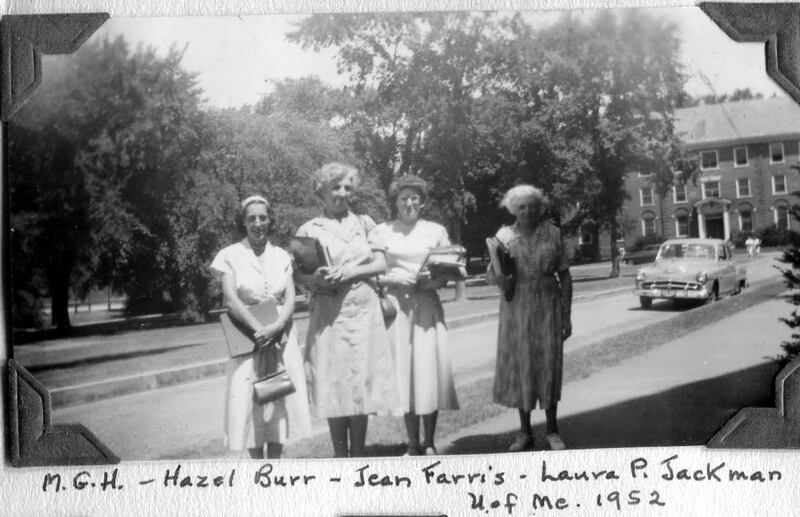 Laura Jackman (seen here in 1952) was another of John’s teachers. Laura Jackman was the math teacher – a woman of infinite patience. She knew her subject but had almost no control of the class, with students talking all over the room. Mary Bates was history teacher and public speaking. Elspeth Earner was a terrific teacher of French and she was the person who may very well have induced me subconsciously to major in French in college and graduate school. At first I had Mollie Farrar Hanson for English but later Phyllis Dimitre, fresh from the University of Maine, took over and really enlivened the class. Agnes Fleming was the Latin teacher – her sister Mary was in the commercial department – but she must have been a very shy, insecure person for anytime when there would be any laughter or whispering she would say, “More time for study”. Occasionally we would have assemblies in the study hall. Mr. Tarbox would lead the- singing. Miss Hanson played the piano, and everyone sang songs like “There’s a Long, Long Trail” or the “Maine Stein Song”. One of Miss McCarren’s productions. Music had little place in school at that time, no band or chorus, since Lou Hill retired. I remember in elementary school it was a great event when Frank Lane, a local musician, brought a tiny Jackie Casey or Phelan to sing. The little fellow stood on the grand piano in Miss Woodcock’s room and we all crowded around the walls. 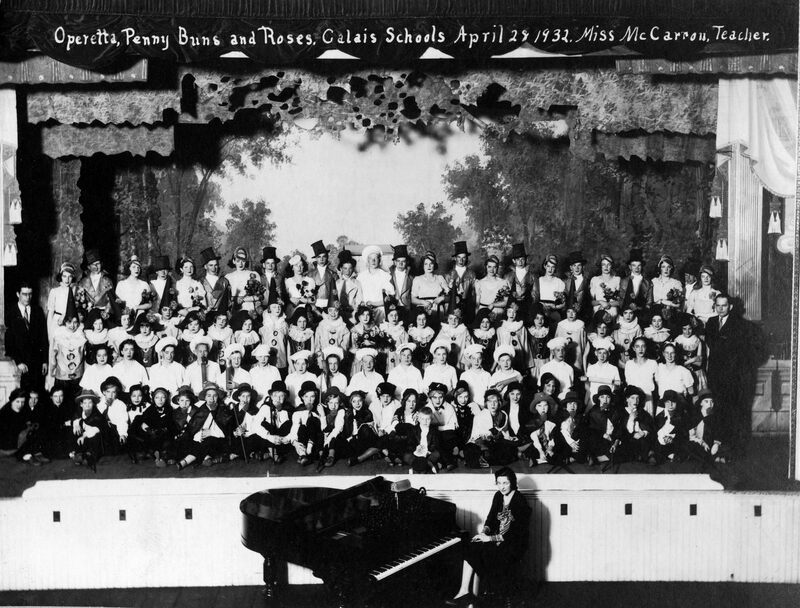 There was a Miss McCarren, who went around to the schools for singing classes and I remember her putting on a production of Gilbert and Sullivan’s MIKADO in the old Opera House. In high school there were annual talent shows when people would sing solos or play musical instruments. I hope these remarks will awaken your own memories of going to school in Calais and perhaps entice you to share your recollections of teachers who had a real influence on your learning and your later life.